One of the questions I most commonly receive on this site is what to do if you have diastasis recti. What exercises can you do, and how can you put them into a safe diastasis recti workout? What should you avoid? How can you prevent this condition from worsening? While I’ve done quite a bit of research on DR (to make sure all of the PBB exercises are safe and progress in an effective manner), it’s not an area where I have a ton of personal experience. While a vast majority of women (and even some men!) have DR, it’s not something that’s often discussed. Wouldn’t it be nice if they told us at our 6-week postpartum appointment EXACTLY what to do instead of “back to our old routine if it still feels good”? 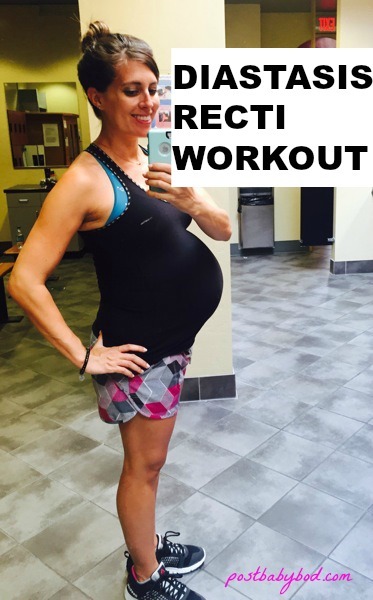 My friend Jess, a Physical Therapist and fellow group fitness instructor, put together this amazing Diastasis Recti workout. She is a wealth of knowledge, and gave me permission to post her video for you here. This is so helpful, thank you!! It’s hard to find a demonstration of proper technique to help improve DR. My boys are 18 months apart so I don’t think I fully healed from the first pregnancy. Again, thank you, I can’t wait to incorporate these exercises into my routine!